My lunch today was a little taste of summer. In the mix I have, organic mixed greens & baby spinach, strawberries, blueberries, raspberries, chickpeas, pom arils, and a few shakes of sesame seeds. There’s also a wee bit of balsamic dresing on there. I was really good considering nearly everything in it is out of season. 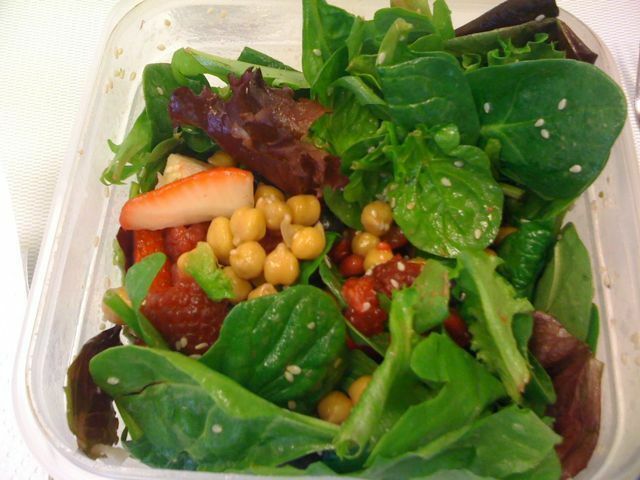 My salad made me miss summer even more than the frigid temps and snow on the ground! I’ll take a salad full of leafy greens and fruit of a veggie salad any day of the week. Unfortunately the dead of winter isn’t reall fruit season, and Generally, I try not to buy produce when it’s out of season. Last night when I was at produce Mecca, the berries looked so yummy I caved and bought some. Food journaling is really important to a lot of people in maintaining healthy eating and portion control. Many healthy lifestyle blogs out there started as food journals. Food journaling has proven effective in helping people loose weight and maintain weight loss. People who food journal are twice as likely to be successful in loosing weight. Some people keep them simple to keep themselves accountable; others keep them for calorie counting purposes. Personally, I do both. Since I am actively (or half-assedly) trying to loose weight, I have been calorie counting. For about a year and a half, I’ve used SparkPeople to track my food, count my calories, and make sure I’m maintaining good overall nutriton. It’s a fabulous (and free!) weight management website, and I would recommend it to everyone trying to loose weight. I was really diligent for about 9 months and I managed to loose 30 pounds. Unfortunately after I got the hang of making healthy choices and finding balanced I stopped tracking as diligently. Being incredibly busy has also made it difficult to track everythig online. Along with my lack of diligent tracking there has been a lack of weight loss. This goes to show me I can maintain weight loss with simple food journaling (posting meals here), but I still need to be calorie counting to loose weight. Since I want to loose the rest of my weight (about 20 pounds or so) by my brother’s wedding in October, I’m getting back on the calorie counting/ serious food journaling wagon. How about the rest of you: do you keep a food journal? What’s your preferred method? Pen and paper? Blog? Website? Do you calorie count as well or just journal to keep yourself in check? Mmmm, that salad look so good! I feel you on the lack of tasty fruit this time of year. I bought some clemetines a few weeks ago and they didn’t taste like anything! A few years ago when I was trying to lose weight I used Sparkpeople. I didn’t have access to the website at work so I did the same thing you’re trying: writing it all down and plugging it in at the end of the day. Worked well for me and I lost the 10 pounds I was aiming to lose. I admit, I also like see the cardio minutes add up!